Boost your child's critical thinking abilities through playing chess. Let Alec's Chess Club for Kids in Studio City, California, provide your kids with group and private lessons on playing chess. Now offering classes specifically for Homeschooled children Monday-Friday. Ask Alec for details. For your convenience, Alec offers daily private lessons online for $30 per hour, or at the Club for $40 per hour. You can also get lessons in the comfort of your own home for $50 and up per hour (depending on distance). Also if you homeschool...group lessons are available at your convenience Monday-Friday. Minimum of 5 children to form a class. Schedule an appointment by calling (818) 220-0257 or filling out the simple form located below. If you have questions please don't hesitate to ask! Enjoy exciting USChess rated chess tournaments every Saturday at Alec's Chess Club for Kids. We start with a half-hour lesson followed by the tournament. After the tournament we finish the day with "for fun" types of chess including: Bughouse, 3-person chess, 4-person chess, 3D chess, Plunder Chess, Magi Chess, etc! This five-hour event runs from 12:00 p.m. to 5:00 p.m and is priced at only $25 a week. Discounts available. See "About" page for details. Please note if you have a son or daughter that happens to be blind, we can also accommodate him or her with a specially designed chess set for the blind, along with personalized instruction. Please contact Alec for more details. • Student of the Year updates! 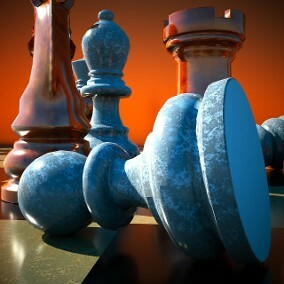 • The Latest Chess News! • Chess Problems to Solve! Contact us in Studio City, California, to schedule private chess lessons for your kids.